Home / News / NATIONAL CONGRESS OF PRE-HOSPITAL MEDICAL EMERGENCY TO BE HELD IN MADEIRA FOR THE FIRST TIME. The event will take place on November 15, 16 and 17, will open on Madeira Island and close on the island of Porto Santo. For the first time in Madeira, the National Congress of Pre-Hospital Medical Emergency will be under the motto “this sea that unites us”. 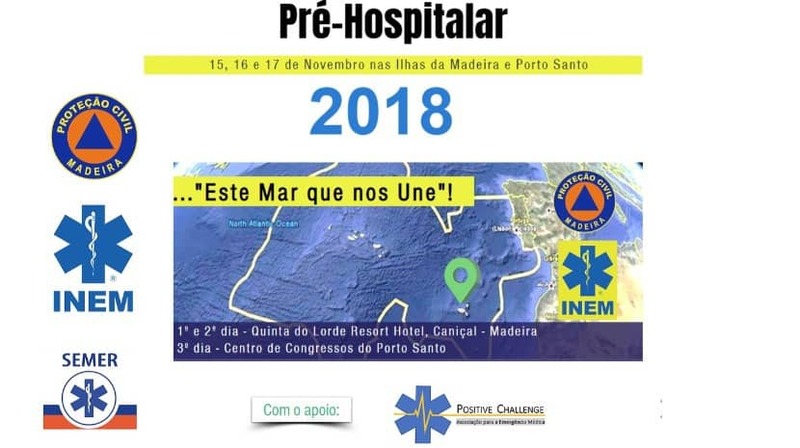 This is the first initiative of its kind in Madeira and Porto Santo, and should bring together many prehospital professionals at the national level. It also marks the joint organization of the Regional Civil Protection Service, IP-RAM and INEM – National Institute of Medical Emergency, which in 2017 signed a collaboration protocol “which aims to foster cooperation between the two entities, in various domains of the pre-hospital medical emergency, “said the institution led by José Dias. The National Emergency Congress brings together a range of professionals from various geographic areas of the country, all linked to the prehospital emergency, such as Luís Meira (President INEM), José Dias (President SRPC), Manuel Antunes (Cardiothoracic Surgeon ), António Brazão (SEMER Coordinator), Carlos Freitas (SRS specialist nurse) and specialists and instructors Itamar Ashkenazi (Medical Response to Major Incidents (MMI)) and Luís Vale, MD and Medical Response to Major Incidents Instructor (MRMI) . Carlos Mesquita, President of the European Society of Trauma and Emergency Surgery, and João Morais, President of the Portuguese Society of Cardiology, are other invited speakers. The panel of speakers is completed by Leonardo Ribeiro, Deputy Coordinator of SEMER and Nélson Bettencourt, trainer at the Regional Civil Protection Service (SRPC). According to the information available, this is the 1st national meeting of the Emergency in RAM, in a national debate of two days, with close to 30 speakers. In all, a total of 300 participants are expected. The program has been devised “to ensure the widest possible coverage, and will address issues such as CRP, trauma, greenways, catastrophe and new technologies in the service of the emergency,” postponed the Regional Civil Protection Service. Also during the congress, the SRPC and INEM will carry out a “Mass Rescue Operation” exercise on board a ship, due to its originality and high committed logistics, it is expected to be able to correspond to a moment of high interest.